Sen. John McCain, R-Ariz., called it "one of the most disgraceful performances by an American president in memory"
President Trump and Russian President Vladimir Putin met in a highly anticipated and much scrutinized face-to-face on Monday. Donald Trump's "America First" slogan morphed Monday into "Me First" as the president unloaded on his own intelligence community and Justice Department to portray himself as the victim of a conspiracy to deny him legitimacy. Trump also blamed American "foolishness and stupidity" for the poor state of U.S.-Russia relations, returning to themes he has repeated at political rallies around the United States. This time, though, he was on foreign soil, standing next to Vladimir Putin, the very man whose government is accused of interfering in the 2016 election to favor Trump. As such, his extraordinary performance fueled criticism of his presidency from both the right and left. And it will likely embolden Putin, who faced no pushback from Trump over the election allegations or a long list of other Kremlin actions, ranging from Syria to Ukraine. Sure enough, critics and even some usually reliable defenders were quick to pounce. Sen. John McCain, R-Ariz., called it "one of the most disgraceful performances by an American president in memory." Watch President Donald Trump and Russian President Vladimir Putin answer questions from reporters following their summit in Helsinki, Finland, on July 17, 2018. House Speaker Paul Ryan, R-Wis., a cautious Trump supporter, said, "The president must appreciate that Russia is not our ally." And Rep. Trey Gowdy, R-S.C., who has been critical of the Russia probe, said that "Russia is not our friend" and expressed hope that Trump's national security aides could convince him that "it is possible to conclude Russia interfered with our election in 2016 without delegitimizing his electoral success." But after his two-hour, one-on-one meeting with Putin in Helsinki, Trump cast doubt on U.S. intelligence findings that Russia interfered in the election, and he dismissed special counsel Robert Mueller's probe into the meddling, suggesting there is no reason to doubt Putin's denials of malfeasance. "I have great confidence in my intelligence people, but I will tell you that President Putin was extremely strong and powerful in his denial today," he said. Current and former Trump White House and campaign officials describe the president as obsessed by any suggestion that his elevation to the White House came as anything other than the product of his own hard work. They say the former reality star and relentless tabloid self-promoter believes that any suggestion of Russian interference undermines his victory — and his brand. It's for that reason that since the 2016 campaign Trump has forcefully rejected any suggestion of Russian support for his candidacy. After his electoral victory, which caught even Trump by surprise, the president reluctantly acknowledged Russian meddling in the election — the unanimous consensus of the intelligence community — while in the same breath suggesting other countries could be responsible. Months later, Trump said he fired FBI Director James Comey because of the lingering investigation into Russian meddling and possible collusion with elements of Trump's campaign. And Trump continues to reject Mueller's probe as a "witch hunt," despite the indictments of Russian hackers and intelligence officials. President Donald Trump accepted the gift during the leaders’ joint news conference before tossing it to first lady Melania Trump. On Monday, Trump also resurrected several debunked conspiracy theories about his opponent Hillary Clinton and the Democratic Party, called out an FBI agent involved in the meddling probe by name and complained about media coverage. All the while, Trump praised his electoral success and again denied any collusion with Russia, something Putin was happy to agree with, though the Russian leader did admit to a preference for Trump, who campaigned for better ties with Moscow. "We ran a brilliant campaign, and that's why I'm president," Trump said at one point. "That was a clean campaign, I beat Hillary Clinton easily," he said at another. "It's a shame that there could even be a little bit of a cloud over it." Trump couched the summit as a triumph of diplomacy, saying he was demonstrating statesmanship by agreeing to the meeting with Putin and savaging those who have expressed concern over its timing and what might have been on the table. Yet, despite vague vows of better ties to come and new cooperation in Syria and on nuclear nonproliferation, neither Trump nor Putin was able to offer details of progress or specific improvements in relations as they spoke to reporters at a news conference in Helsinki after their long-awaited summit. 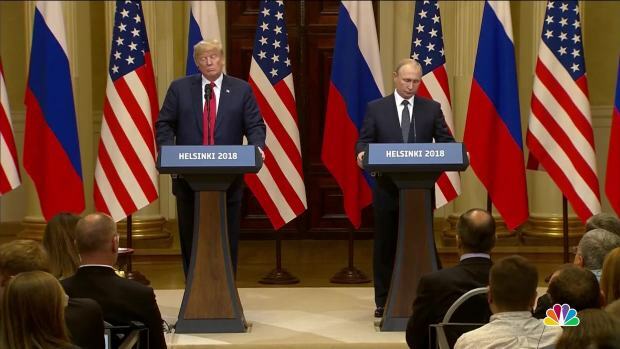 President Donald Trump threw his support behind Russian leader Vladimir Putin during a joint press conference in Helsinki, saying Putin was "extremely strong and powerful in his denial" of Russian interference with the 2016 presidential election. The only tangible sign of progress was Putin's gift of a World Cup soccer ball to Trump. The only points of disagreement came when Putin gently chided Trump for withdrawing from the Iran nuclear deal and when the Russian leader, not Trump himself, explained the U.S. position on Russia's annexation of Crimea. "He continued to maintain that it was illegal to annex it," Putin said of Trump's stance. Putin, for his part, played the role of statesman, serving as a kind of emcee and parrying questions from the press by professing incredulity at the allegations of meddling, before making an astonishing offer of a "deal" with the president. His proposal to trade access to Russians accused of hacking in return for Russian investigators engaging in investigations of Kremlin critics was "an incredible offer," according to Trump. Trump's openness to the symbolic offer appeared to cede the high ground to Putin. To Russia hawks, even consideration of the proposal pointed to the success of Putin's efforts to shake the foundations of American democracy. After all, that was the ultimate goal of Russia's election meddling, U.S. officials have assessed. Putin appeared to poke at the sensitive subject when he responded to a question about meddling by asking, "Do you believe United States is a democracy?"